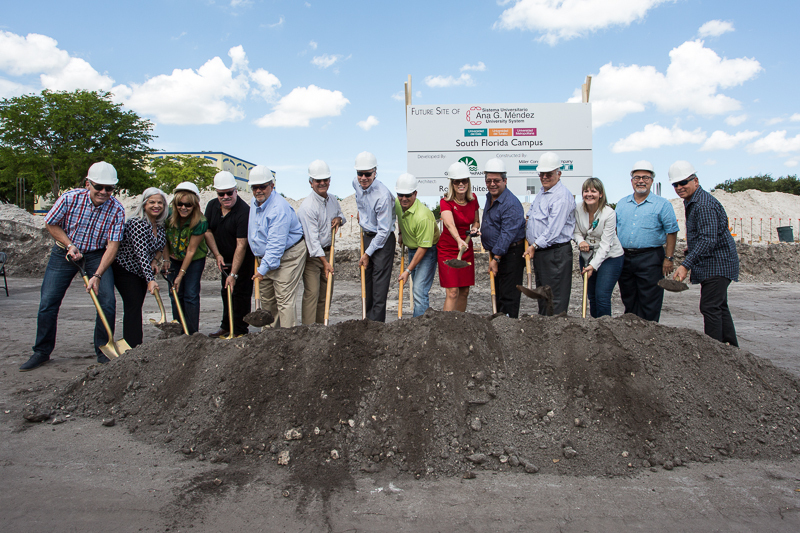 Miami Lakes, FL (June 24, 2016) – On Thursday, June 23, The Graham Companies along with officials from the Sistema Universitario Ana G. Méndez broke ground on the future site of the new Sistema Universitario Ana G. Méndez South Florida Campus. Designed by Roux Architects and being constructed by Miller Construction, the 50,000 square foot building South Florida Campus is anticipated to be used as a showcase for the University. Sistema Universitario Ana G. Méndez is the largest private university system in Puerto Rico. System-wide there are over 40,000 students. The University System uses the Discipline-Based Dual Language Immersion Model®, which focuses on the development of English & Spanish language skills. The goal is to develop students who can function professionally in both English & Spanish, while offering over 16 different undergraduate and graduate degrees in program fields such as engineering, education, nursing, and business administration. Alongside Sistema Universitario Ana G. Méndez leaders, representation from The Graham Companies included Carol Wyllie, President Graham Commercial, and Stu Wyllie, CEO, along with members of the Town of Miami Lakes Economic Development Committee, Miami Lakes Councilman Nelson Rodríguez, Miami Lakes Councilman Manny Cid and Miami Lakes Town Manager Alex Rey, were on hand to celebrate the start of construction of the new building. Estimated completion date for the Building is May 2017. A family tradition of service since 1932, The Graham Companies is best known for the creation and development of Miami Lakes, a 3,000-acre master planned community. Today, The Graham Companies maintains being the largest landowner in the Town of Miami Lakes through apartment, office, industrial, retail, and hospitality holdings. Continuing with its original roots The Graham Companies continues to be involved in the agriculture business with dairy, beef, and pecan orchard farming located in the middle of Florida and Southwest Georgia. Further information about The Graham Companies is available at www.miamilakes.com.